Pro-American activists want to primary all 34 GOP members who signed a letter urging a DACA amnesty in December, while business lobbies portrayed the legislators’ signatures as support for an even larger ‘dreamer’ amnesty. Immigration is a volatile issue in a way that others are not. There is not the same level of emotional engagement [in other issues]. Immigration fires people up and you can lose your job over it if you don’t know what you’re doing. ALIPAC calls for GOP primary challengers to defeat incumbent Republicans on Kate’s List named in honor of Kate Steinle. Kate’s List is a record of Republican lawmakers in Washington, DC, who have indicated they want to join with Democrats to pass DACA, Dream Act, or Comprehensive Immigration Reform Amnesty for illegal aliens. The 34 names on Kate’s List are GOP lawmakers who signed a letter (View) to Speaker Paul Ryan asking him to focus on passing DACA Amnesty for illegal aliens before Christmas 2017 instead of focusing on protecting Americans like Kate Steinle and thousands of others harmed by illegals each year! ALIPAC’s Kate’s List will be used to seek GOP primary challengers willing to file and run against these corrupt incumbents who are very vulnerable because they are out of line with their primary voters just like [former] Rep. Eric Cantor, [former Rep.] Renee Ellmers, and Senator Luther Strange, who lost their seats for supporting Amnesty for illegals too! We write in support of passing of a permanent legislative solution for Deferred Action for Childhood Arrivals (DACA) recipients before the end of the year … We must pass legislation that protects DACA recipients from deportation and gives them the opportunity to apply for a more secured status in our country as soon as possible. Reaching across the aisle to protect DACA recipients before the holidays is the right thing to do. 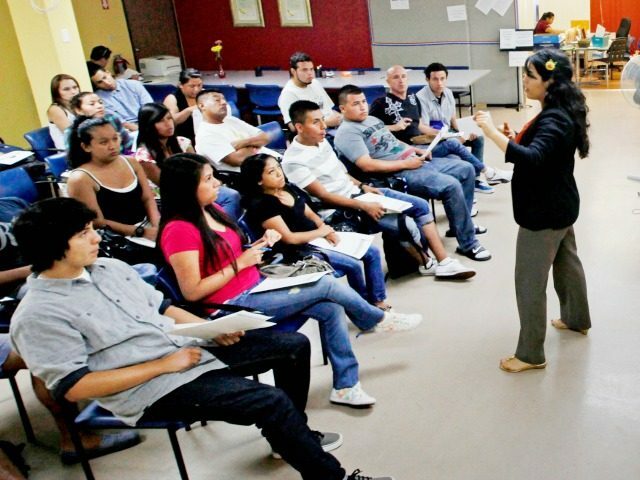 On the other side of the debate, the business groups — and some establishment media outlets — quickly inflated the legislators’ unpopular support for an amnesty of 690,000 DACA beneficiaries into apparent support for an amnesty of ‘dreamers,’ which is a term used to describe all 3 million young illegals. Three-dozen Republican lawmakers on Tuesday called on party leaders to help enact a permanent solution for “dreamers” by the end of the year, saying the issue has festered for too long, creating legal and economic uncertainty for young immigrants and the companies that employ them. "Dozens of Republicans now clamoring for a ‘dreamers’ fix by year’s end"
The letter was portrayed as an endorsement of the larger Dream Act for 3 million illegals in a Tweet from FWD.us. The group was created by high-tech investors — including Facebook founder Mark Zuckerberg — to maximize the inflow of white-collar foreign workers and to lower salaries paid to American white-collar professionals. The FWD.us group favors a no-strings Dream Act for illegals, partly because the GOP threat to end of DACA is pressuring Democrats to accept President Donald Trump’s popular, salary-raising immigration principles, which include the end of chain migration. Similarly, the American Immigration Lawyers Association portrayed the legislators’ letter as an endorsement of the full ‘dreamer’ amnesty. The group favors easier mass-immigration. When asked about letter’s support for “dreamers,” press aides said the members’ letter only requests aid for the 690,000 people enrolled in the DACA program. “The letter, and our intent, is to specifically address the 690,000 DACA recipients,” said Scott Weldon, an aide to Virginia GOP Rep. Scott Taylor. Taylor used his Twitter account to distance himself from the praise provided by the ACLU, which also portrayed him as a supporter of amnesty for 3 million illegals. Taylor also defended himself against a Tweet from the Federation for American Immigration Reform. Taylor was backed up by FWD.us, which described letter’s support for an amnesty by Christmas as “a balanced compromise approach.” Todd Schulte is the group’s president and was formerly a chief of staff at Priorities USA Action, the Super PAC supporting Obama’s re-election. This attempt to bootstrap a dream amnesty on the pretext of a DACA fix is not new — and the [GOP legislators] should have known this would happen. It is hard to argue that they are not conspirators to bring a huge dream amnesty under a more limited fix. They are part of the [pro-amnesty] strategy, and it is almost certain that [Rep. Carlos] Curbelo and [Rep. Jeff] Denham and a few others knew that would happen, but a lot of congressmen don’t know anything about immigration so it is easy to believe they were sweet-talked into backing something and got into more trouble than they bargained for. Some of those members, this might be a political danger for them. It could spark a primary or a more serious primary competition than they expected. That’s all to the good, as a lesson that you should know what the heck that you’re talking about before you wade into the immigration issue … [and] unlearn a lot of the crap that you think you know which is untrue … The sweet talk from the business lobbyists is what turns members’ heads. Here's the 34 GOPs calling for a DACA amnesty with no offsets:https://t.co/OjtTwGGaXY You could express yours thoughts by calling them thru the Capitol switchboard at 202-224-3121. The other legislators who signed the letter include Reps. Scott Taylor, Dan Newhouse, Rodney Davis, Carlos Curbelo, Mia Love, Mark Amodei, Brian Fitzpatrick, Mike Coffman, Peter King, Ryan Costello, Fred Upton, Jeff Denham, John Faso, John Katko, Chris Stewart, Susan Brooks, Adam Kinzinger, Mike Simpson, Mimi Walters, Leonard Lance, Pat Meehan, Elise Stefanik, Tom MacArthur, and Chris Smith, Will Hurd and Bruce Poliquin. Few of the legislators advertised their support for the amnesty letter. For example, Indiana’s Brooks did not mention it on her Twitter account. Other legislators who kept their support quiet include Faso in New York, Simpson in Idaho, Lance in New Jersey, Upton in Michigan, Meehan in Pennsylvania, Costello in Pennsylvania, Smith in New Jersey, Hurd in Texas, Poliquin in Maine, and Fitzpatrick in Pennsylvania. The DACA and ‘dreamer’ amnesties are very unpopular. Business groups and Democrats tout the misleading, industry-funded “nation of immigrants” polls which pressure Americans to say they welcome migrants. But the alternative “fairness” polls show that voters put a much higher priority on helping their families, neighbors, and fellow nationals get decent jobs in a high-tech, high-immigration, low-wage economy. The political power of the voters’ fairness priorities was made clear during the GOP primaries and again in November 2016. The declining enthusiasm for granting those protections was shared by partisans of all stripes. Democrats (from 53 percent to 44 percent) and Republicans (from 28 percent to 19 percent) both registered 9-point drops over the time frame, while enthusiasm among independents dropped 12 points, from 35 percent to 23 percent. Also, multiple polls show the public opposes any threat to shut down the government to win an amnesty for illegals. The shutdown threat is backed by only 26 percent of blacks, 35 percent of Democrats, 21 percent of moderates, 37 percent of people who earn more than $200,000, 23 percent of post-graduates, and 31 percent of people who strongly disapprove of President Donald Trump’s policies. The poll of 1,000 likely voters was conducted November 30 and December 3. The poll used the term “dreamer’ to refer to the 3 million illegals, not to the four million young Americans who will become adults this year. A Morning Consult/POLITICO poll showed that only 1 in 5 swing-voters, or roughly 20 percent, want a government shut-down to force an amnesty for DACA illegal aliens. Each year, four million Americans turn 18 and begin looking for good jobs in the free market. But the federal government inflates the supply of new labor by annually accepting one million new legal immigrants, by providing almost two million work-permits to foreigners, by providing work-visas to roughly 1,000,000 temporary workers, and doing little to block the employment of roughly eight million illegal immigrants. The Washington-imposed economic policy of mass-immigration floods the market with foreign labor and spikes profits and Wall Street values by cutting salaries for manual and skilled labor offered by blue-collar and white-collar employees. It also encourages discrimination against American workers, drives up real estate prices, widens wealth gaps, reduces high-tech investment, increases state and local tax burdens, and hurts kids’ schools and college education. Furthermore, it pushes Americans away from high-tech careers and reduces the work activity rate below the rate in foreign rivals, which sidelines millions of marginalized Americans and their families, including many who are now struggling with opioid addictions. The nation’s cheap-labor immigration policy has also reduced investment and job creation in many interior states because investors can create low-wage jobs in coastal cities where there are many new immigrants. Without immigration, investors and companies would have to create jobs in places with higher unemployment or lower wages. For example, almost 58 percent of zip codes in Michigan had fewer jobs or businesses in 2015 than in 2000, according to a new report by the Economic Innovation Group. Roughly 19 percent of people in Michigan live in those distressed areas.